Bouncy Beanstalk Walk is the sixth level of World 1 found in Yoshi's New Island. Yoshi starts the level in a grassy area with a beanstalk and some enemies nearby. 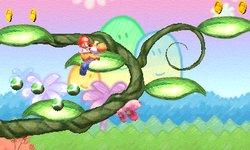 Yoshi must navigate through an enemy-filled area by using beanstalks and moving platforms to reach the Checkpoint Ring. The next area starts in the clouds, with Yoshi having to navigate across more moving platforms and clouds, with more enemies appearing as he progresses. The Goal Ring can be found soon after as well.